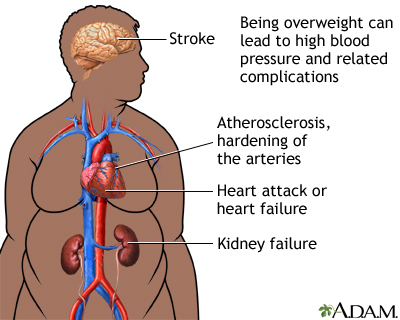 Obesity increases a person's risk of illness and death due to diabetes, stroke, heart disease, hypertension, high cholesterol, and kidney and gallbladder disease. Obesity may increase the risk for some types of cancer. It is also a risk factor for the development of osteoarthritis and sleep apnea.